Looking for the best grill baskets for vegetables? You're in the right spot - we love treating veggies like they're the main dish! And what better way to do so than to grill them? Our top 5 picks for vegetable grill baskets. Some suggestions for veggies you can throw on the grill. The difference between the grill basket styles. The pros and cons of all our top picks. Different Grill/BBQ Basket Styles Available? Although perfectly fine for some things (such as corn), you can't always place vegetables directly on the grill. Their delicate nature tends to result in them falling apart and thus falling directly into the fire, rendering them inedible. Having a basket also gives you the freedom to cut the vegetables however you'd like. You don't have to worry about slicing something to thin, such as an eggplant, because once its in the basket you don't have to worry. Also, even though there are many pans such as cast iron that you can throw onto a grill, they don't have the ability to let the vegetables gently kiss the flames since they will be entirely protected by the pan itself. This is critical for that unique char-grilled flavor, so going without a basket is going to be difficult. Finally, if you don't happen to have a cast iron pan, the odds of regular ﻿cookwar﻿e being grill safe is slim to none. The list of vegetables that you can grill is almost endless, but here are some of our absolute favorites to throw into a grill basket. Because you can cut them into your favorite shapes, you'll be able to find new textures for these veggies that you haven't tried before. Without getting too far off on tangent, its important to note that many people don't take proper care into how they treat their vegetables. They're kind of an after-thought in the standard western diet and thus get neglected heavily in how they are flavored.​ We highly recommend taking the time and experiment on any vegetable that you grill to figure out the best way to season/flavor it and take the time to do things like marinating! You may have heard the saying, "There's more than one way to grill a vegetable". Well, maybe you haven't, but that's the truth. There are many different grill baskets and they each come with their set of unique properties. Some holes are bigger, some are smaller and one of our suggestions isn't quite a basket at all, but rather a mesh which will work just as well. 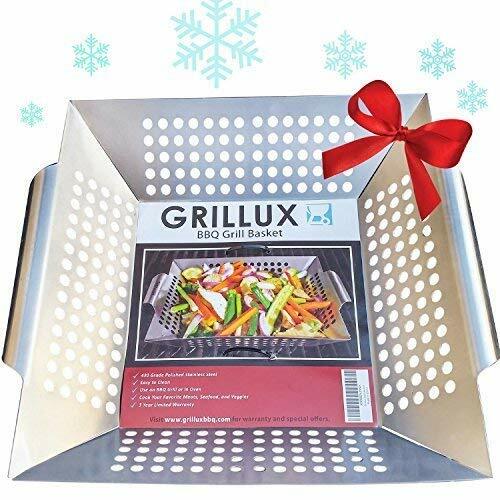 The Grillux is probably exactly what you think of when you think of a grill basket. It doesn't close entirely, but has raised edges which keeps the food inside the basket and prevents it from rolling out. It has handles on the side which can be used to toss things around and keep them moving so your vegetables don't stick and burn. These handles also make it easy to pick up so long as you're wearing heat resistant gloves. Measures in at a decent size 13"L x 12"W x 2.25"H.
Grill holes are sized in just a way where flames can touch the food without items being able to fall through. Made of stainless steel which is very resilient to wear and has the ability to be restored. Handles aren't really that ergonomic, wouldn't be ideal for camping and gloves are needed to handle it. Might be too large for some small sized grills. 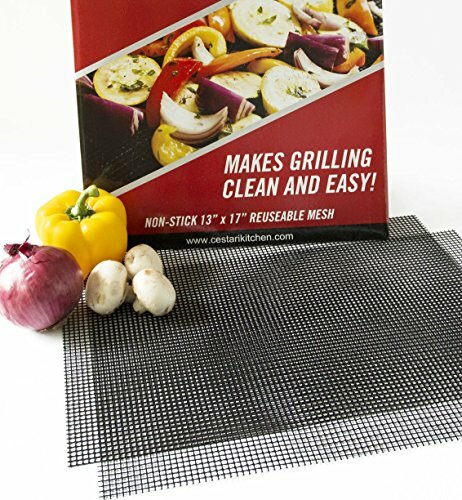 This product isn't a basket at all, but rather a reusable mesh that can be cut into any shape and placed on the grill. It performs the same function as a grill basket though and will allow you to place vegetables right on top of it without risk of it falling through. Can be cut it into shape which gives it a bit more versatility than the baskets on this list. Also good for use outside of the grill such as in an oven (assuming you were toasting something dry like bread). Not as easy to move around and maneuver as a grill basket. 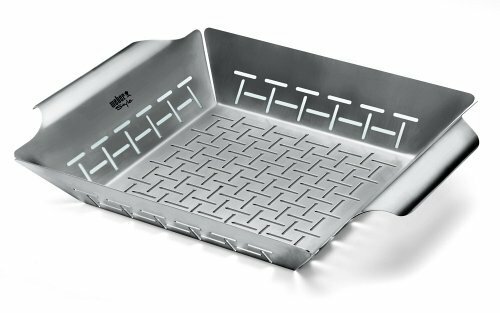 This Weber basket is quite similar to the Grillux in all features beside the mesh shape. The mesh on this product is long and thin rather than round. This offers the advantage of being able handle things that would be a bad fit for the other basket such as some certain types of nuts. Just like the Grillux, it's a nicely sized basket at 2.5"H x 11.8"W x 13.8"D.
Much like the Grillux, the handles aren't the best designed that we've seen and tossing things might be a bit of a pain. If you're one of those people who likes to keep different vegetables separate, than this might just be what you need. 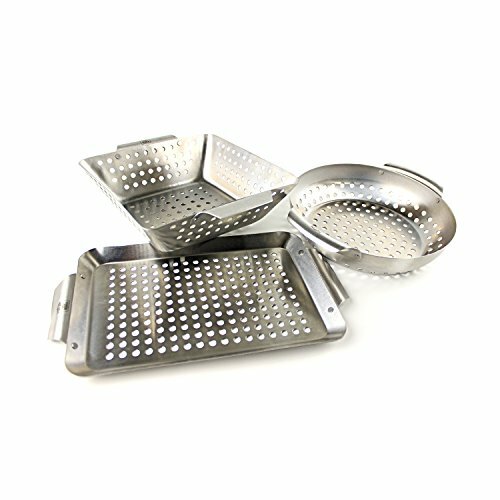 Rather than just getting one grill three: a flat pan, a round basket, and a regular grill basket. Individually they aren't as big as some of the other top selling grill baskets on the market, but if you add up the surface area, it is quite a deal. Ideal for keeping different vegetables separate - say if you had someone that doesn't like onions. Made of stainless steel which should give you tons of longevity. May be inconvenient to manage all of these components rather than just having one big grill basket. 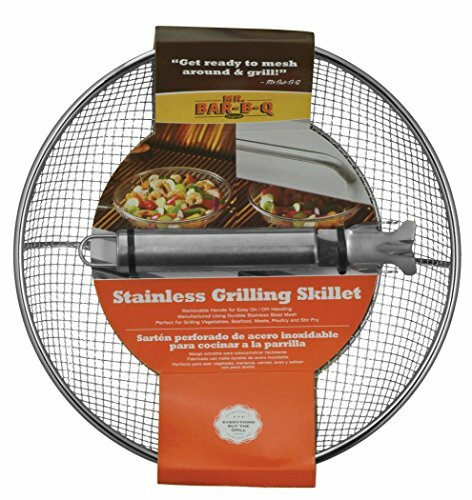 The Mr. Bar-B-Q Grill Basket or "Skillet" is impressive just on the design alone. The basket has a detachable handle which allows the user to move vegetables around without having to touch the basket itself - genius! The mesh allows the vegetables for plenty of flame exposure while still keeping them safe and compact. Detachable handle makes this basket extremely easy to handle. Stainless steel is durable and has lots of longevity. Decent size at 2.36 x 11.93 x 11.93 inches. If you lose the handle you're out of luck! If you're looking to grill more veggies, all of these options are great. Like we said earlier - treat your veggies like they are the main dish and you'll be amazed at all the things you can do with them!